Getting It Right For Every Child (GIRFEC) is a programme that aims to improve outcomes for all children and young people. The GIRFEC approach is underpinned by a set of core values and principles which are integral to and apply across all domains of working with children and young people. Getting It Right For Every Child is the foundation for work with all children and young people, including adult services where parents are involved. It builds on universal health and education services, commencing antenatally through the early years and includes work with all children and young people. What is getting in the way of this child or young person’s well-being? When assessment, planning and action are needed, practitioners can draw on the GIRFEC National Practice Model. This provides a framework to structure and analyse information consistently so as to understand a child or young person’s needs, the strengths and pressures affecting them and then to consider what support they might need. The Well-Being Indicatorsare areas in which children and young people need to progress in order to do well now and in the future. They allow practitioners to consider information, which may identify needs and concerns, and to make decisions about what should be done to appropriately support children and young people. They are used to record observations, events and concerns and help in deciding whether or not a Universal Child’s Plan (UCP) is required. 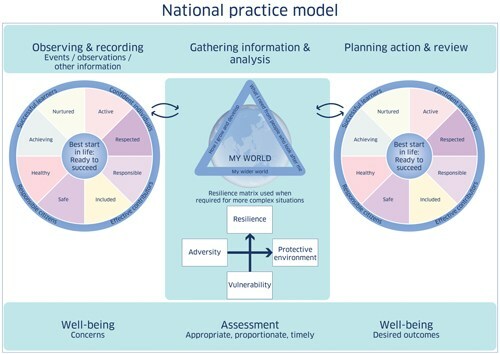 If it is necessary to open a UCP, at a Single Agency or Multi Agency level, the My World Triangle, and in more complex cases the Resilience Matrix, can then be used to gather, structure and assist in the analysis of information. This will help in the formation of short and long term outcomes.